Abstract: Autonomous vehicles (AVs) are expected to widely re-define mobility offers in the future, transforming many offers into autonomous services. Nonetheless, this development requires an expected transition phase of several decades in which some regions will provide sufficient infrastructure for AV movements, while others will not support AVs yet. In this work, we aim to provide an operational planning model for mobility services operating with autonomous, conventional, and dual-mode vehicles, in regions with AV-ready and not AV-ready zones. 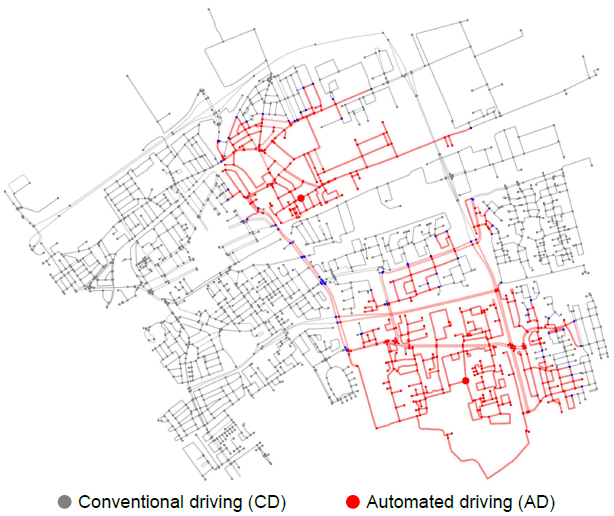 To this end, we model detailed automated driving areas considering several possible infrastructure settings for the city of Delft, The Netherlands. On this hybrid network, we introduce a new mathematical planning model based on a site-dependent variant of the dial-a-ride problem (DARP). With an extensive numerical study we provide insights into how operational costs, service levels, and fleet utilization develop under scenarios of multiple infrastructural settings and technology costs. In this way, we provide the foundation for related, partially autonomous routing in future research and in real-word. Reference: B. Beirigo, F. Schulte, R.R. Negenborn. Dual-mode vehicle routing in mixed autonomous and non-autonomous zone networks. Accepted for the 21st IEEE International Conference on Intelligent Transportation Systems (IEEE ITSC 2018), Maui, Hawaii, November 2018.